Carson Emmett (age 11) won his second NHRA Jr. Drag Racing Eastern Conference Finals presented by Huddleston Performance title when the 2018 edition of the annual event at Bristol Dragway wrapped up Friday night. Emmett was joined in the winner’s circle by first-time winners Shelby Todd (6-9), Grant Cook (10), Cody Owens (12), Mason Bean (13), Lane Kahley (14), Jake Heaton (15), and Isaac McDaniel (16-17). Numidia Dragway Team 1 won the team competition, the first team title for the Pennsylvania track. Cataula, Ga., racer Todd earned the 6-9 age-group Wally when she outlasted Radford, Va.’s Forrest Radford in the final. Todd, who was part of Silver Dollar Raceway’s team, got off the starting line first, .028 to .037, then ran a 12.09 (12.02 dial) to turn on the win light. Radford, a Bristol Dragway competitor, finished second with a 14.29 (14.18). Cook tallied the first of two wins for Huntsville Dragway when he bested Silver Dollar Raceway runner Hayden Wallace in the 10-year-old class final. Cook, who lives in Franklin, Ky., had the advantage at the Tree by more than seven-hundredths, and he turned that into a 9.02 (8.96) to 8.93 (8.93) win against Hawksville, Pa., competitor Wallace. The 11-year-old class final was also a Huntsville Dragway vs. Silver Dollar Raceway battle, and Huntsville again came out on top when Emmett defeated Bruce Thaxton. Cedar Bluff, Ala.’s Emmett added this year’s 11-year-old title to the one he earned in the 6-9 age group in 2015 when Butler, Ga., resident Thaxton went red by .002-second. Emmett clocked an 8.99 (8.96) on his victory pass. Owens took the 12-year-old class Wally home to Orange Park, Fla., when he was able to outlast the field, including Morgantown, Pa.’s Bobby Pennabaker in the final. Owens, a member of Gainesville Raceway’s team, hit the Tree with a .014 that gave him an eight-hundredths advantage, and he used it to push Pennabaker, who part of Maple Grove Raceway’s team, into an 8.96 (8.98) breakout. Owens turned on the win light with a 9.04 (8.99). Mason-Dixon Dragway’s Bean made the trip from Dickerson, Md., pay off when he came out on top in the 13-year-old bracket. Greenwood, Ind., racer Layla Dillman, a member of Lucas Oil Raceway at Indianapolis’ team, made Bean’s job easier when she went red in the final round. Bean posted a 7.94 (7.90) en route to victory. 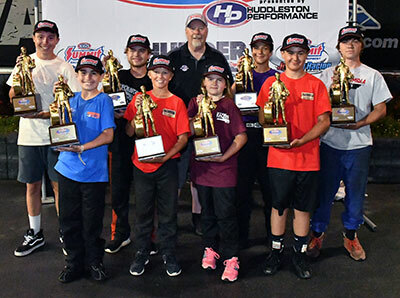 Kahley helped lift Numidia Dragway to the team championship when he stopped Bristol Dragway’s Vance Houston in the 14-year-old age-group final. Newland, N.C., racer Houston was first off the starting line, but Millton, Pa.’s Kahley was able to drive around him and win on an 8.03 (8.01) to 7.99 (7.95) count. Heaton, a National Trail Raceway competitor who hails from Mount Vernon, Ohio, defeated Sunbury, Pa., racer Liberti Ferster in the 15-year-old category final. Heaton led the race from start to finish, leaving the starting line first by .017-second and crossing the finish line ahead of Numidia Dragway competitor Ferster in a 7.99 (7.95) to 8.02 (7.98) race. In the 16-17 age group, Virginia Motorsports Park competitor Dalton Hayes, who lives in North Chesterfield, Va., got the slight advantage on the starting line, but Piedmont, S.C., runner McDaniel was able to drive around him and win on an 8.07 (8.03) to 8.10 (8.04) count. McDaniel was part of the Atlanta Dragway team at the event. In the team competition, Numidia Dragway Team 1 came out on top, tallying 33 points. 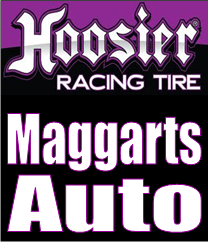 Silver Dollar Raceway Team 1 finished second with 29 points, followed by Bristol Dragway Team 1 with 28 and Maple Grove Raceway Team 1 and Lucas Oil Raceway at Indianapolis Team 1 tied at 27 apiece. Huntsville Dragway collected its fourth straight Team Spirit award, and Virginia Motorsports Park earned the trophy for Best Appearing Track for its Wallywood themed shirts and decorations.